Hutchinson Memorial Scholarship Fund was established in memory of John and Linda Hutchinson, founders of Hutchinson's Flowers who have done business in the Sykesville area for over 35 years. John and Linda both gave so much to the youth in the community. This scholarship gives a $1,500 Scholarship to a graduating senior from Liberty and Century High School, to continue their education. To date, $40,000+ in scholarships have been awarded. Enjoy a fun evening of painting, food (provided by Salerno’s) and drinks. 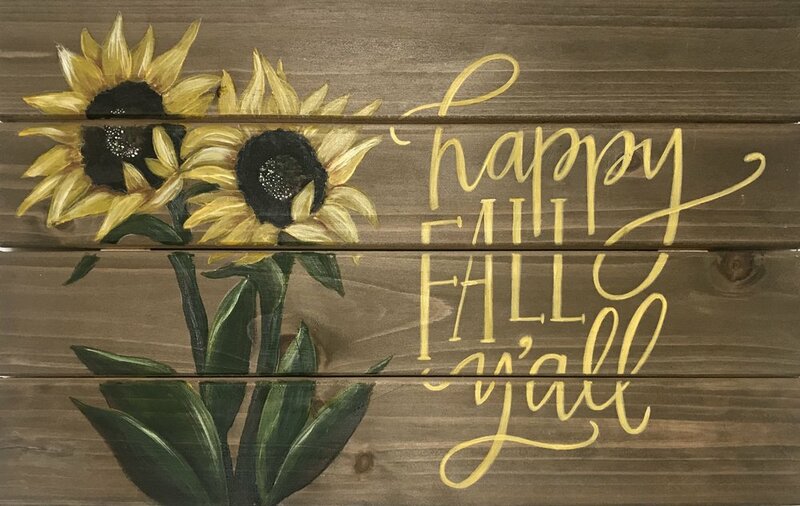 Sykesville artist, Vivian Davis will lead you step-by-step to recreate an original pallet design, Happy Fall Y’all. Choose an optional quote, such as Welcome Fall or Hello Fall. No experience necessary. $40 per person with advance payment; includes all materials, dinner, wine and ice tea. Although wine is included, you can also bring your own.